The University of Amsterdam (UvA) is a non-campus-based university embracing the motto: “the city is our campus”. The various UvA faculties are scattered across Amsterdam. Consequently, students and researchers from different disciplines rarely meet each other. A study by the German Max Planck Institute for Demographic Research has shown that interdisciplinary research collaboration increases knowledge, generates new ideas, allows for higher quality of research and helps networking for future work (Hin 2). Physical proximity of scholars from different disciplines plays a role in creating interdisciplinary collaboration (Hin 1). The UvA Research Hub aims to compensate for the university’s geographical drawbacks and the absence of an infrastructure that reinforces the exchange of knowledge across disciplinary bounderies. It is a platform that allows UvA students and researchers (MA students/PhDs/postdoctoral scholars) to present own researches, to find projects related to their research interests and to share knowledge and collaborate interdisciplinary. It consists of a discovery section to find projects and researchers of interest, a blog section to discuss/present topics, a page of the researcher profiles, and a personal My UvA Hub page. 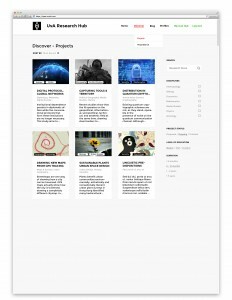 The discover section is subdivided into a project view and a visual search view. The project view allows users to browse through UvA research projects and enables to find projects with similar research focuses from various disciplines. The result list is generally sorted by recency, but it is also possible to sort results by project titles (alphabetical order), date of publication, duration, level of education, discipline and number of visits. Project specific information is displayed for each project, including title, research focuses, disciplines and a short research description. The search refine function on the right hand column enables users to filter projects by checkmarking disciplines and/or choosing a project status, educational level or duration. A major feature is the research focus search, which is cross-disciplinary and clusters research focuses according to the user’s interests. An example would be the topic of sustainable development, which is tackled by disciplines such as biology, economics or engineering science alike. The visual search function gives a graphical network view of projects based on mutual research focuses and disciplines. It uses the same search refine function as the project view to show projects that directly or indirectly relate to a combination of search queries. By typing in the desired research focuses in the visual search box and/or ticking targeted fields of research on the sidebar, those search words appear as bubbles in the center of the visual search. Users can search for either projects or researchers by switching the search option on top. Inside the graphical circle the chosen disciplines appear as big bubbles in different colours, while the research focuses appear as small bubbles. Outside of the centering circle the related projects are presented. Red highlighted bullets mark projects that relate to every search query and are also listed below the visual search results. Projects that partly relate to the search queries appear as grey bullets. Moving the cursor over the grey projects highlights the related bubbles within the inner circle, as well as all other projects related to the queries (see picture). 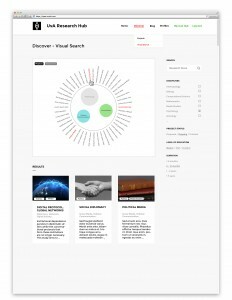 Hence, the visual search makes a relational network of interdisciplinary research visible and accessible. 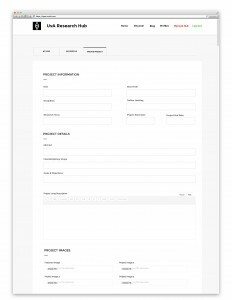 The single project page displays the project description in the central column as well as additional information about the project and the researcher on the right column. The project description includes the project’s abstract, its interdisciplinary aspects and goals. A detailed project description is also available. The right column displays the researcher’s details, project status, disciplines, research focuses, project start date and expected duration. Social media feeds may be embedded. Students and researchers who are interested in contributing to the project can click the collaborate-button and email the researcher directly. For registered researchers the My UvA Hub page displays the projects and researchers one is actively engaged with as well as the projects and researchers one follows. Furthermore, it provides recent updates about these items of interest. 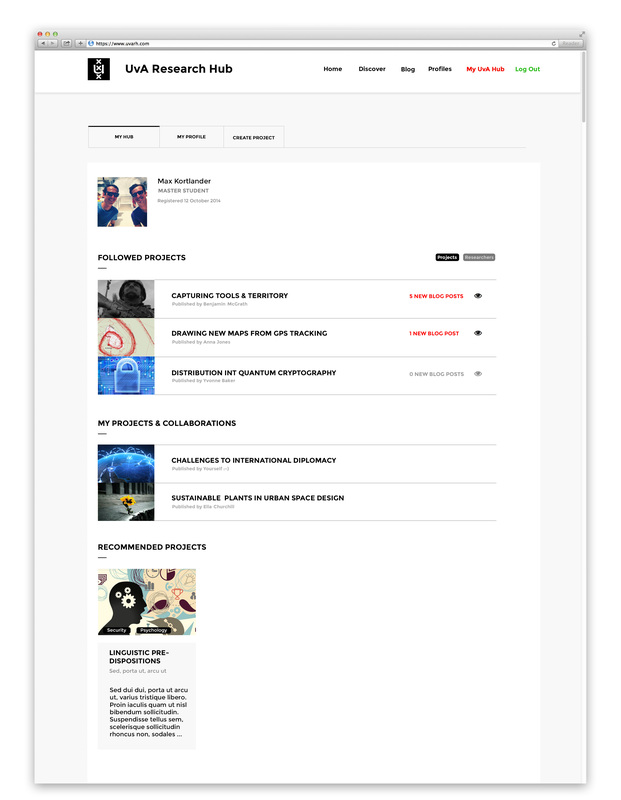 It displays recommended projects which the user might find interesting, based on the user’s research focuses and the projects one is engaged with. 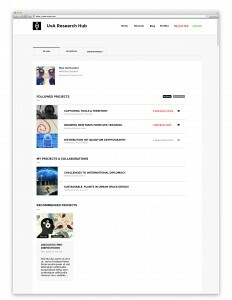 The create section allows users to create a project page for their research. They fill in relevant project information (title, abstract, images, etc. ), as well as the project’s discipline and its interdisciplinary scope, reflecting the possible collaborative aspects of the project. The research focus field categorizes projects. Research focuses are user-generated. Automated completion technologies predict the research focus the user is typing in. Whenever the user types in a new research focus, it is automatically added to a database for future use. 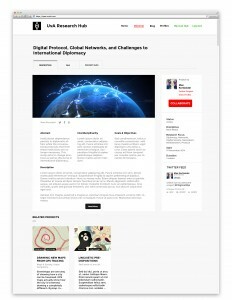 The blog page displays information, dialogues and discussions about interdisciplinary research events, featured projects, work in progress and useful collaboration tools (to name just a few). Users can add events directly to the calendar, which is synchronized to Google- or i-calendars. To further facilitate networking a non-formal Research Hub Nite takes place once a month. This fast-paced presentation event, based on the PechaKucha model (20 slides at 20 seconds per slide), allows students and researchers to present their projects and interact with fellow scholars. Ideally, the UvA Research Hub would be integrated into the online infrastructure of the UvA. Consequently, it would be managed by a PhD student acting as a webmaster (for grant/credits) or by the UvA’s Institute for Interdisciplinary Studies (IIS). UvA alumni may also access the website and take part in knowledge sharing and brainstorming. The UvA Research Hub will allow the public and enterprises to learn more about ongoing research at the UvA and promote the university’s research profile in order to attract more students, researchers and cooperation partners. As in fact most universities in the Netherlands are non-campus based, the UvA Research Hub could also be adapted by other Dutch universities, and eventually as a national interdisciplinary research collaboration platform for all universities and research institutes in the Netherlands.